Some of you may have decided to do graphic design because you thought that it would be easy. There is nothing easy about it. It is an industry that is very saturated, so if you want to stand out and go far, you will have to work at it. You will spend many sleepless nights trying to prefect a project… sometimes starting over and over again. The interesting thing is that if you are truly made to be a designer, you will almost enjoy those sleepless nights. You will be so caught up in your creative energy that you will forget the time. A few weeks ago I came across this article, Advice for Young Designers, and thought it was good to share. In order to be good at what you do, you have to work hard. Put in the extra hours and make it as good as it can be. Do the effort and you will benefit from it. Constantly improve your craft and challenge yourself to do something that makes you uncomfortable. Trying something new and pushing yourself is what makes us grow as designers. Some of our best work comes out of it. Please take the time to read the entire article because there are some good tips there… read complete article here. I was intrigued by the design for the recent Great GoogaMooga festival in Prospect Park. These were created by Mark Miller & Dave Franzese, who worked on the branding for Bonnaroo 2012, which is a huge music festival that takes place every year. 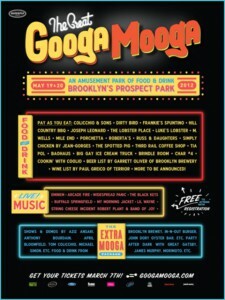 The team said that for the Great GoogaMooga posters, they were inspired by Brooklyn Bodega storefronts. I really love this style of vintage typographic design. What do you think? Anyone one you guys like? Justcreative.com by Justin Cass is very informative blog with design tips and information about whats going on in the design business. He also provides from other websites and blog that are also informative and helpful. This is how we alter ourselves for the public. I guess Photoshop is not the only way to change the way we look! What do you guys think? Your ePortfolio project will be due in a few weeks. Ask questions during class, but also use the Getting Started section of OpenLab for more information.